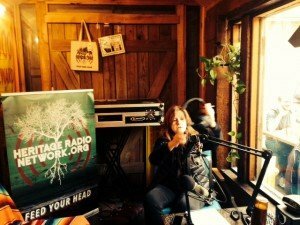 I’m thrilled and proud to report that Linda Pelaccio, the mind behind the Taste of the Past show on Heritage Radio did an interview with me and it’s on air! You can listen to us discussing my book Beyond Bratwurst and German food history now, anywhere, anytime – it’s just a click away. Modern technology is awesome, there is no other way to put it, and never did I realize this more than on this month long trip to the East-American shores. It doesn’t mean the world around can’t be cosy and homely: Heritage Radio is actually produced in a wooden container shed literally behind Roberta’s in Brooklyn/NY – a very casual and very famous not-only-pizza-restaurant – neat to discuss food while people are eating on the other side of the window! So, I hope you’ll enjoy listening as much as I enjoyed doing this.